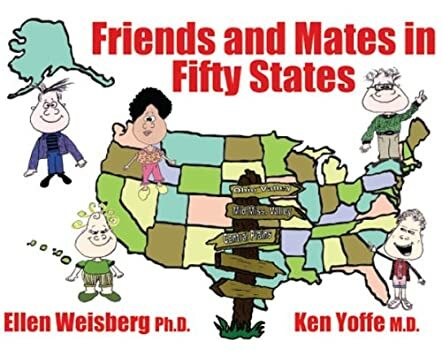 Friends and Mates in Fifty States by Ellen Weisberg and Ken Yoffe gives an insight into the different states of the United States of America through the eyes of five friends; Wandering Willy, Sightseeing Susie, Nosy Normie, Meandering Mickey, and Exploring Ellie. Together with them, readers learn about the land, culture, and essence of each one of the different states, its importance, and what makes it different from the other states. The United States is full of beaches, deserts, lakes, rivers, canyons, and mountains, and each state is introduced to readers with the help of rhyming verses. These five boys and girls meet their friends and mates while traveling to these states. So sit back and enjoy the trip with these five friends and discover new places! The book is fascinating, a must-have for all school and public libraries. There is a wealth of information for young readers that teaches them more about new places and destinations in a simple and easy way. The pictures are not only bright and colorful, but insightful too, and they make the rhyming verses more enjoyable to read and understand. It's a good bedtime storybook and helps to teach kids about new places in a fun and interactive way. Books like this are perfect to make the process of learning fun and enjoyable for children. The book gives just enough information, and the entire presentation and layout makes it very appealing and catchy to readers. I really like the concept and thought that has gone behind the book in making kids familiar with the states of America. The Farmington Public Library received a complimentary copy Friends and Mates in Fifty States by Ellen Weisberg and Ken Yoffe and ordered a few more for our collection at the Boys & Girls Club of Farmington library.